The description of a Powercon connector in Wikipedia includes this statement: It comes in two deliberately incompatible variants to prevent the user from connecting to mains supplies together. What this means in simple terms is that the connectors are constructed in such a way that the power can flow in only one direction-from the power source to the device that needs power. Powercons use blue to designate power output on cable mounts and gray to color code the inputs on cable mounts to designate power input. 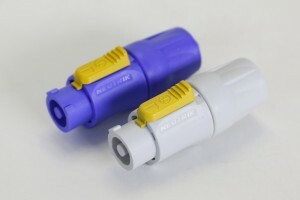 That means that a blue male cable mount connector will always mate only with a blue chassis mount connector. The same holds true for the grey version of the connector. Keying inside the connectors prevents you for ever plugging a blue line mount connector into a grey chassis mount connector and also prevents plugging a grey line mount connector into a blue chassis mount. Previous Previous post: Dummy Plug? What’s That? Neutrik PowerCon Cables Copyright c 2016 Harrison Bros, Inc.
Harrison Bros. Inc. is your online source for bus seat tape. Our line of PowerCon cables features genuine Neutrik conncectors. Everything we sell comes with a “satisfaction guaranteed” promise, and that has been our policy since 1986. The items on our web site are in-stock and available to ship same day. We’ve had years of “hands on” experience with the things we sell, and you can count on us to meet your gaffers tape, battery and cable needs. We use what we sell and can guarantee that it will meet or exceed your expectations.